Bauke Mollema (Blanco) showed the best pre-Tour de France form of his career at the recently completed Tour de Suisse, moving from fifth to second overall on Sunday’s final time trial. 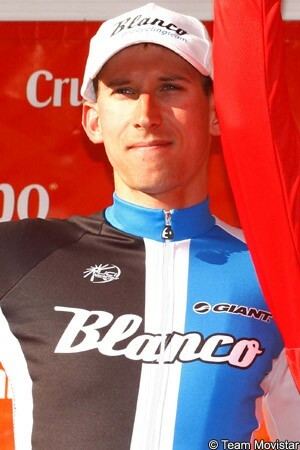 Mollema started conservatively on the 16km flat section beginning the time trial course, and then made up steady ground on the final 10km climb, finishing third on the stage. Rui Costa (Movistar) blasted to the stage win and overall Tour de Suisse victory as a result, and other than the Portuguese rider, Mollema was the biggest mover on the final stage. At the first time check, Mollema was outside the top ten, and one of the slowest of the high ranked general classification riders starting at the end. But after the Dutch rider changed bikes and began the climb, he slowly but surely gained back most of the time he lost early on his time trial bike. Mollema’s result on the finish line was even a bit of a surprise, as he gained back so much time quickly on the Flumserberg climb. But the Blanco rider stated that everything went according to the plan his squad had mapped out ahead of time. Bested only by winner Costa and runner up Tanel Kangert (Astana) on the stage, Mollema went from fifth to second overall. He started the day behind previous overall leader Mathias Frank (BMC Racing), Roman Kreuziger (Saxo-Tinkoff), and Thibaut Pinot (FDJ), although time gaps were all within a minute. Mollema finished a minute and two seconds behind the on-fire Costa in the overall, with eight seconds in hand on Kreuziger, and 24 seconds on Pinot. Frank had an off day and dropped all the way to fifth, 1’43” behind Costa in the final standings. The 26-year-old has nothing left to do now but put the finishing touches on his form for the Tour de France. His Blanco squad, which will have a new sponsor in Belkin, is expected to feature himself and Robert Gesink as co-leaders. Although Gesink rode the Giro d’Italia for Blanco, and if he falters, the pressure will be on Mollema to produce the GC ride for the team. The runner up spot was Mollema’s best ever result in the Tour de Suisse, but it wasn’t without its setbacks along the way, though team director Jan Boven took some good signs from this. “Naturally, it did not go exactly as it should have with the time penalty and the communications glitch, but I am impressed with the way Bauke dealt with it all,” Boven commented. “He demonstrated resiliency and just kept fighting back. Bauke continues to develop as a leader and that is good to see, especially in the run-up to the Tour where he will fulfill that role.